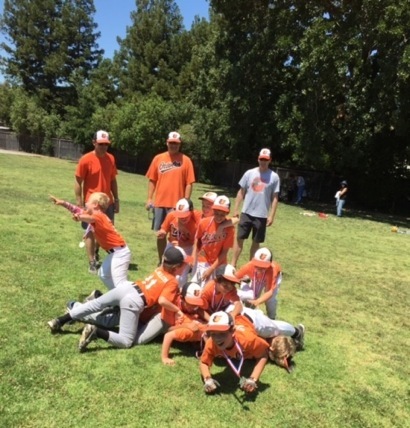 The little Menlo-Atherton Little League AA Team that could, the Orioles, completed a colossal journey last Saturday morning (June 6) by winning the Championship! They came together in March, most never having met nor played together, and at least one of the 12 was a newcomer to baseball. Under the very able and positive guidance of three terrific parent-volunteer coaches — Chris Scott, Kevin Miller and Ren Riley — the Orioles team began to form. The first playoff game of the year was in May 18, and it resulted in a one-sided loss against the Red Sox. The skills were there but not the drive. After some discussions about goals and a great practice, the drum started beating. And it kept beating and beating and beating — louder and louder and louder. So loud in fact, it never stopped beating for seven straight games. The boys learned the true meaning of teamwork, through their ups and downs, injuries and losses and ultimately decided together that they enjoyed the feel of the win together much better. So much so, that they dug down and in a double elimination series, with their backs against the wall at every playoff game after the loss on the 18th, they managed to scrap it out and win each of the seven consecutive games (Red Sox, Blue Jays, A’s, Rangers, White Sox, Indians — twice) to ultimately take the championship. “These guys played together as a team,” said coach Chris. “They never settled for defeat, and they have shown more heart than anyone could have ever expected.